Indian diamond bangles are very popular with married women in India. Of course the combination of diamond and gold has always been alluring for women across the world. 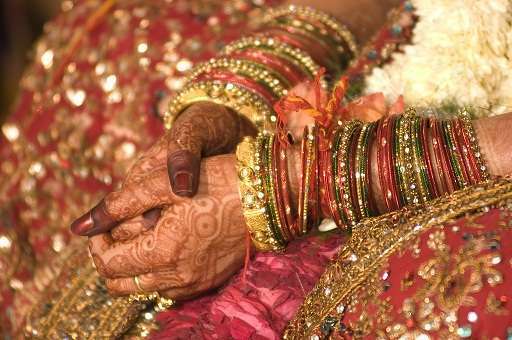 However, in India it takes on a special significance as gold and silver bangles are traditionally worn by married women. So for an Indian woman the gift of an Indian diamond bangle is very special. The diamond bangles can be created with a solid gold base or utilize cutwork techniques to create a mix of diamonds flowing through the gold and visible space in between. Traditionally the diamond bangle has small diamonds scattered across the exterior circumference of the bangles. Depending on the budget Indian diamond bangles can be created with 10 to 12 diamonds or maybe with circular rows of 3 to 4 dozen diamonds depending on the style preferred by the women. With a solid gold base horizontal and vertical stripes of diamonds are created on the bangles. In fact one of the more beautiful creations is the checkerboard effect with diamonds set alternatively with the gold base to form a checkerboard pattern. This pattern is created by setting one gold square and one diamond square throughout the circumference of the Indian diamond bangle. Some bangles are created using the die cut procedure where gold is placed across the circumference and Victorian style filigree is created in the center of the bangles. Diamonds are then set on four points of the bangle in a flowery or geometric design. Indian diamond bangles may also be created out of uncut diamonds which have unique irregular shapes. These bangles are usually set in the gold base according to their shape and the gold is molded around them to encircle the uncut diamond. Alternatively more than one stone is utilized to create colorful Indian diamond bangles. A ruby or emerald in the shape of tear drops or a flowery pattern maybe incorporated throughout the circumference of the bangles. The Indian diamond bangles are not made in a simple circular manner and may also have filigree on the edges making them look like a vine creeping across the wrist of the woman wearing it. The size of the Indian diamond bangle also differs and basically is created according to the budget and the design element the wearer desires. In filigree design, alternative gold pieces are linked together to the diamond stone. However if it is a broader bangle then the larger diamond base is covered completely with diamonds and other gemstones. Traditionally the gold bangle is available in multiples of two and often a dozen bangles are created out of six different designs which are similar but can be worn individually also. This is a very cost-effective way of creating Indian diamond bangles and using them for a long time to come. Some solid gold bangles are hammered and chiseled out to make flat and uneven surfaces on which uncut diamonds are adjusted on the top to create unique designs. These bangles are considered highly contemporary and are also available in a square form. Often a small loop is created on the edge of the diamond bangles and a small diamond is suspended from the corner of the bangles. Sometimes, small diamond encrusted balls of gold are grouped in bunches and suspended through a long chain. Whatever your choice there is more than ample quantity of beautiful Indian diamond bangle designs available across the market for you to select from.